Inflatables add fun to any party! Decorate your party with one of our many inflatable party decorations. Inflatables make a great accessory decoration for your theme party or hand them out as party favors to your guests! We offer a variety of inflatables for just about every themed party you can imagine! 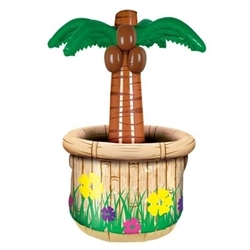 Planning a jungle or beach themed party and need some inflatable jungle animals or palm trees? We've got them! Or perhaps looking for some more spooking decorations for your Halloween decorations try our inflatable jack-o-lanterns or black cauldron or Dracula party cooler for drinks! We've got inflatable buffet coolers for holiday parties, kid's themed birthday parties, and inflatable tabletop coolers just for fun! A great way to use inflatables at your party is to get one of our themed inflatable coolers! We offer a variety of these as well that are great for indoor and outdoor events to store cold waters, sodas, or beers. 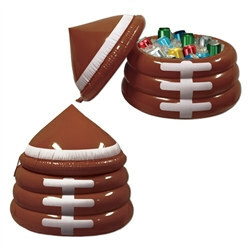 We have coolers like jack-o-lanterns, Uncle Sam's hat, beer mugs, footballs, birthday cakes, tiki inflatables and so many others! You could easily incorporate the use of an inflatable cooler at your party! We have inflatable buffet coolers as well that can hold cold picnic foods like picnic salads and other picnic foods. These inflatable tabletop coolers will certainly be a topic of conversation at your next family picnic! Regardless of your inflatable needs we’ve got you covered right here at PartyCheap.com!